On the two sub-pages under this heading, I have reproduced some of my photographs and drawings. Please see the text heading on each sub-page for an introduction to how I got started in each of these pastimes, and what I have done in each over the years, particularly in the short time since I have been retired from teaching and research. Judy with "It's a Red Slipper Morning!" at the Cole Art Center. This regional contest receives hundreds of entries each year. In 2016, the contest required photographs to have been taken in East Texas, and they were juried by Dr. Scott M. Lieberman, a photographer known internationally for his photographs of the Columbia Space Shuttle explosion that happened over East Texas in 2003. All selected photos were displayed in the bank at 300 E. Whaley in Longview from June 27 through July 7, when prizes were announced at a reception. I submitted 5 photos; the first 3 were from my flower 'portrait' series: "Crepe de Chine Canna," "Dogwood Embrace," and "Royal Purple" [iris]; and the last 2 were of animals -- a squirrel, "Takin' it Easy," and a pair of bluebirds on a birdbath, "The Blues Couple." For the exhibit, photos were displayed in groups of 6-10 on a series of boards set up around the bank; the two shots below were taken following the final reception, showing me with my photos at different locations inside the bank ["Dogwood Embrace" is not shown here]. Judy with "Royal Purple" and "The Blues Couple." "Crepe de Chine Canna" and "Takin' it Easy." The Nacogdoches Convention & Visitors Bureau and the SFA Cole Art Center co-sponsored this show; entries were to be for 3 thematic categories (Quintessentially Nacogdoches, Nacogdoches Dining, Nature). The show was juried by faculty of the SFA School of Art, and selected photos were displayed in the Upstairs Gallery at the Cole Art Center, Nacogdoches, Nov. 17. 2016 (opening reception) – Jan. 14, 2017. My 3 entries were titled: “Red Azaleas” (category Quintessentially Nacogdoches), “Lunch at Newk’s” (category Nacogdoches Dining), and “Downtown Loft in Historic Oldtown Nacogdoches” (category Nature). My "Downtown Loft," a picture of a mourning dove nesting in a niche in an old brick wall off of Main Street, received an Honorable Mention and was exhibited in the Cole Center. "Downtown Loft in Historic Nacogdoches" (green ribbon denotes Honorable Mention). This show, presented in conjunction with the Pollinators PowWow held in Nacogdoches in spring 2017, was curated by Charles D. Jones, director of the LaNana Creek Press, SFA School of Art, and David Kulhavy, Lacy H. Hunt Professor of Landscape Ecology and Entomology in the Division of Environmental Sciences of SFA's Arthur Temple College of Forestry and Agriculture. The invitation to participate was distributed internationally, and works were submitted from artists from around the world, including Costa Rica, Brazil, S. Korea, Russia, Africa, Malaysia, the U.S., and Mexico. Works selected by the curators were exhibited in the Upstairs Gallery at the Cole Art Center, Nacogdoches TX; May 4 (opening reception) – May 20, 2017. My entries included "A Flight of Pollinators," a series of 4 digital drawings, each framed separately with an accompanying haiku: titles were "Butterflies & Blooms," "Beetles & Yucca," Bats & Saguaro," and "Bees Dance the Great Sun/Flower/Hive;" plus a fifth digital drawing, "Bees and Coneflowers," that was framed along with the poem “Bees Dancing,” by Ken Lauter. Our five entries will also be included in the full-color trade book planned for the show. Also, two additional photographs of mine, "Monarchs Feeding" and "Bumblebee on a Giant Gaillardia" are to be included in the fine art press book to be published by LaNana Creek Press, each photograph facing a page with our poems -- my 4 haiku from the show, opposite the monarchs photo, and Ken's "Bees Dancing" poem, opposite the bumblebee photo. Judy with Ken and our five framed pieces from the Pollinators of the World show in the Cole Center. The pictures were placed together as a set in an alcove with its own overhead lighting. This event was co-sponsored by the City of Nacogdoches and SFA. My five entries were titled: "The Cole Art Center Main Gallery - Texas National, 2017," "Pollinators of the World Show at the Cole Art Center -1," "Pollinators of the World Show at the Cole Art Center -2," "Historic Downtown Nacogdoches: Corner of church and Main," and "Sculpture from the Botanical Gardens at SFA." 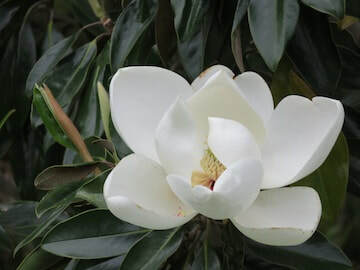 The last two from this set were selected by the cultural district committee for showing at the Cole Art Center on June 4; prizes are to be announced later in the year, with a planned exhibit of the photos at the Nacogdoches City Hall, and on City of Nacogdoches social-media sites. Screenshot from the KTRE video. My "Historic Downtown Nacogdoches: Church and Main" is shown at the lower right (in the video, my "Sculpture in the SFA Botanical Gardens" can be seen on some pans). Sponsored by the SFA Friends of the Visual Arts, as the “central and most crucial fundraiser for scholarship and grant funds for students of the SFA School of Art," this event provides a single 12" x 12" wooden panel (shadow-box style with 2-inch sides) free to each artist, and entries may be in any medium (painting, photography, textiles, wood sculpture, sculpture/ceramic, etc.) as long as at least one side of the piece stays within the 12 x 12 panel dimension. My entry was titled “Aspen Eyes, Series 2, #3” and was a digital photo with collage detail enhancement, mounted and sealed on the wooden panel; on the 2-inch sides of the shadow-box panel I also included excerpts from additional photos in the aspen series. The 80+ entries were on display for viewing and silent bidding in the Main Downstairs Gallery at the Cole Art Center in Nacogdoches TX, June 22 – July 15, with sales completed during the closing reception on July 15, when my piece was purchased for $100. "Aspen Eyes, Series 2, #3," as shown in the Cole Center at the 2017 12 x 12 exhibition. For the 2018 12x12 (see the immediately preceding item for background), I made a digital drawing based on the beautiful rectangle complexes of Piet Mondrian. I have always loved Mondrian's blue-red-yellow compositions, and recently when I was looking at some, those colors struck me as very remniscent of the colors on the Texas flag. So I designed my own version of a blue-red-yellow Mondrian composition and modified it with details alluding to things Texan: a wood-grain background fill instead of Mondrian's favored off-white/grey, and a tilted Texas star. The title was "LoneStar Mondrian." This year, the 70+ entries in the show were on display for viewing and early (silent) bidding in the Main Downstairs Gallery at the Cole Art Center in Nacogdoches TX, June 28 – July 14, with sales completed during the closing reception on July 14. My piece was one of only six to receive an early bid of $250. "LoneStar Mondrian," at the Cole Center. Each year, historic downtown Nacogdoches celebrates this festival with an evening of dancers, music, food, and art displays. Hundreds of people attend from all around the region. This year, along with other colorful thematic exhibits at the Cole Art Center, the SFA School of Art also sponsored a silent art auction. Submissions were invited from local artists, and were available for viewing and bidding for a week preceding the day of the festival, Saturday, Nov. 3. I prepared a digital print, mounted on an 8" x 8" shadow-box panel, titled "El señor Mondrian en su jardin" ('Mr. Mondrian in his garden'). The piece sold for $50. 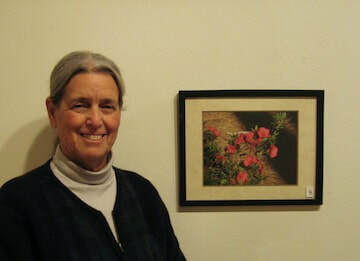 In the photo below, my print is shown (in front of the vase of flowers), as it appeared on the display table, along with a sampling from the other 12 entries. "El señor Mondrian," at the Cole Center. 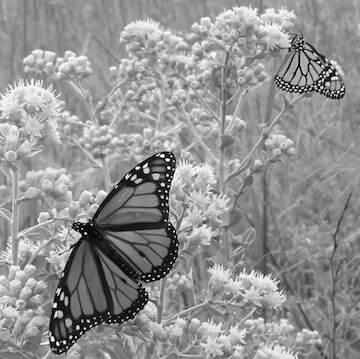 "Monarchs Feeding," in Jones & Kulhavy (Eds), 2018.